It’s easy to plan a garden that will encourage butterflies to visit. The key is to provide a combination of nectar plants on which the butterflies can feed and larval food plants that will encourage them to reproduce in the area. Butterflies are most active throughout the summer, particularly late summer, so plan your garden to have plenty of nectar-producing flowers over the course of the summer and early fall. Most butterflies like full sunshine, so yard gardens or plants on the deck should be in full sun if possible. However, if you live near the woods, you may be able to attract members of the few species that prefer shade. When caring for a butterfly garden, it is important not to use pesticides or anything else that might be harmful to butterflies. Instead, you can plant marigold and mint, which act as natural insect repellents. If you have a large yard, planting onions throughout at random intervals will repel pests and stop the spread of root maggots. Another method of natural pest control is attracting ladybugs to your garden. Plants that draw ladybugs include Angelica, Caraway, Cilantro, Coreopsis, Cosmos (particularly white), Dandelions, Dill, Fennel, Geraniums, Tansy, and Yarrow. Ladybugs can also be purchased from certain garden supply stores. Overall, butterflies prefer flowers that are brightly colored, have strong scents, and are native to the local area. Butterflies show the most interest in flowers that are dark pink, purple, red, orange, or yellow. It’s a good idea to plant a variety of different nectar sources in order to attract many different types of butterflies. *Flowers pictured to the right include hibiscus, marigold, and zinnia. 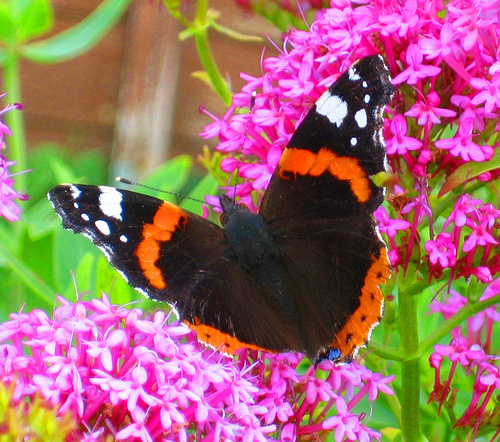 For photos of all the flowers that attract butterflies, visit the Butterfly Plants page. If you provide lots of plants that can serve as food for butterfly larvae, you will attract female butterflies and may even encourage entire butterfly colonies to establish in your area. The offspring of a number of North American butterflies feed on certain vegetables, such as carrots, parsnips, dill, alfalfa, and clover. However, different species have different preferences, soit’s a good idea to learn about the preferred foods of the butterflies that you wish to attract. Monarch butterfly young prefer milkweed, and a number of other species like thistles or nettles. The larvae of many species also feed on certain trees, such as oaks, aspens, willows, and cherries. Butterflies usually lay eggs in late spring, and caterpillars pupate after 3 or 4 weeks, so it’s important to have plenty of host plants in the late spring and early summer. After 9 to 14 days in their cocoons, caterpillars emerge as adult butterflies. Butterflies are attracted to puddles, especially when sweet drinks are added to the water. A puddle can be easily made by burying an open container (such as a bowl or bucket) to its brim, adding sand or gravel until it’s nearly full, and then filling the remaining space with water, a drink that contains fructose, or stale beer. Another way to attract butterflies is to leave a piece of overripe fruit, particularly a grapefruit or an orange, out for a few days so that it spoils, and then place it on a hanging plate or lid for butterflies to feed on. This may attract other bugs as well, so it’s best not to place this sort of feeder right by your window or door. Instructions for making a butterfly feeder and butterfly nectar can be found on the Butterfly Feeder page. For more on butterfly gardening, see Photos of Plants That Attract Butterflies. For a full list of gardening articles, visit the main Gardening page. Government of Canada – Canadian Biodiversity Information Facility. (2003). “Butterfly Gardening.” Reproduced with permission from The Butterflies of Canada by Layberry, R.A.; Hall, P.W. ; & Lafontaine, J.D., University of Toronto Press, 1998. Jones, R. (n.d.) “Butterfly Nectar Plants.” Thebutterflysite.com.